Look of the day: Flower power!! Sin duda una de las tendencias que viene pisando fuerte esta temporada es la mezclas de flores. El truco para mezclar flores o estampados de tamaños diferentes reside en que sean estampados de la misma gama cromática (es decir con uno o dos colores en común). También hay que tener cuidado con el tamaño del estampado y su dirección. Mejor optar por diseño pequeños y/o en diagonal o vertical si somos redonditas o en horizontal y grandes si somos delgaditas. En este caso, y aunque os parezca increíble, compré las dos piezas que llevo por separado con unos años de diferencia...¡y resultaron ser de idénticos colores! ¿Vosotras os atrevéis con la mezcla de flores o estampados? ¡Un besazo y feliz martes! Without any doubt one of the trends of the season is the flower mix. The tip to mix flowers or different sizes prints is to choose prints with at least one shade in common (or two if your wish). You also have to be careful with the size and the direction of the print. If we’re full figured women we’ll choose small designs and diagonal or vertical directions. Whilst if we are thin women we’d better opt for big prints and horizontal or zigzag directions. In this case, even if you find it unbelievable, I bought the two pieces separately with a couple of years apart… and it turned out the shades were identical!! What do you think ladies? Flower or print mix, do you dare? Un besote desde el desierto catarí! Me encanta el toque que le da el chaleco vaquero al look floreado. El corte te sienta genial. Soooo pretty! You look awesome! Pretty as a flower. beautiful flower combination!!! You look like ready for spring!! wonderful love it. amazing prints!Would you like to follow each other? You mixed prints absolutely perfectly! Patricia, the way you did it in this look should be in a magazine, I am loving the 4th to the last photo of you! The hair looks beautiful as well! Great blog and I'm your newest follower. Great and simple at the same time. 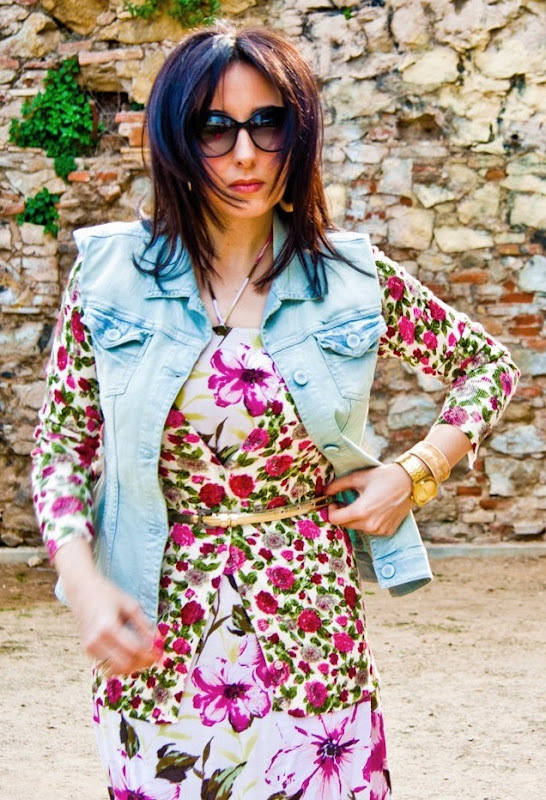 Hi I'm Patricia a 44 years old Office Manager and Fashion Blogger living in Barcelona (and loving it!). Welcome to my world. New in: It's spring time!! © Madame Chic Bcn | All rights reserved.